In Highest Bidder the interaction between Effect Cards is crucial to how you play. Make your choices based on how the cards in your hand play together — and prepare for of a lot of laugh-out-loud moments when things don't go as planned. Even a hand with few numbered cards can dominate if you play your Effect Cards right. 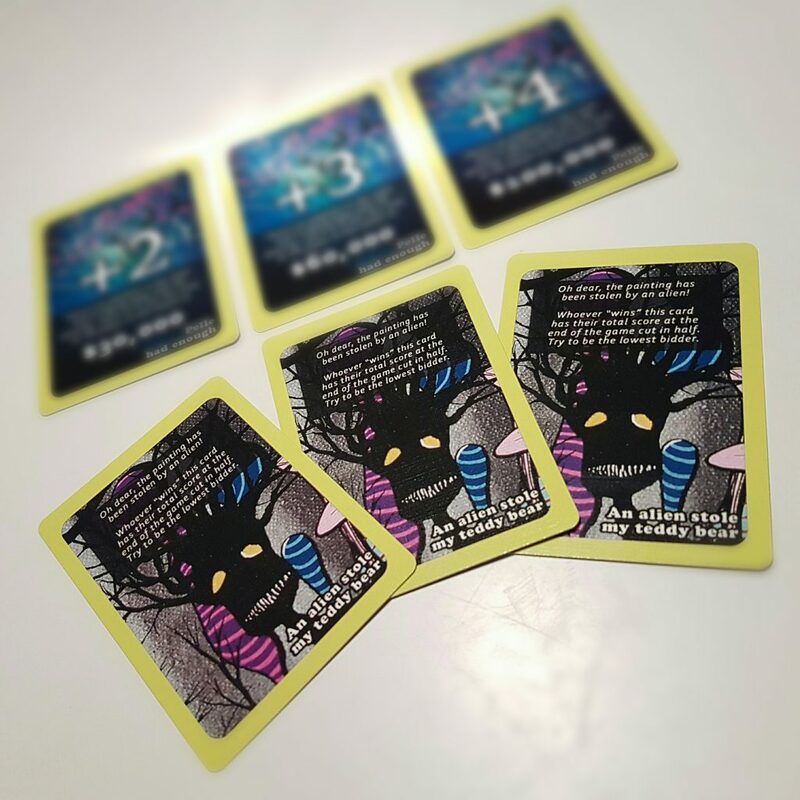 On this page we go through all of the cards one by one, both the regular Effect Cards found in Highest Bidder and Highest Bidder: Art Auction, as well as the advanced cards only found in the Art Auction edition. The images on this page are of the cards in the Highest Bidder: Art Auction edition, however the effects of the cards are the same in the original version. Do you have an idea for a new Effect Card? Please don't hesitate to get in touch using the form at the bottom of the page. As seen in both Highest Bidder and Highest Bidder: Art Auction. This straight-forward card doubles the value of the current Point Card. There are two copies in a standard deck and when combined it can turn even a lower-scoring card into a game changer. But beware! You better be confident that you'll win the bid, or you run the risk of accidentally doubling the score of another player. Oops! 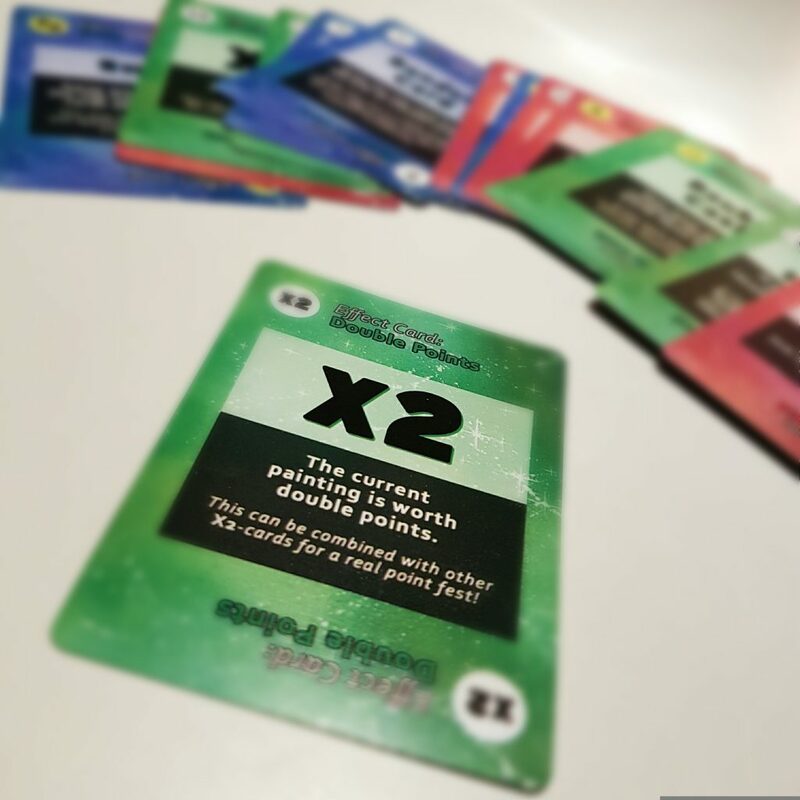 Since all cards in your hand have to be played at some point during a round you might find yourself in a situation where you wish you did not have a "Double Points" card in your hand. One workaround is to play the card during the very last bid of the round, followed by the "Return to Hand" Effect Card. The Double Points-cards are essential if you want to beat the high score. This card gives you the option to return whatever card was played before it to your hand. The most obvious use of this would be to play it after a numbered Bid Card: if you know that you have already lost the bid, or if you have won the bid overwhelmingly, you can take the Bid Card back to reused next turn. You may be tempted to play only a numbered Bid Card followed by the "Return to Hand" card in an attempt to win a low-scoring card. While this is a clever thought and sometimes a wise move, experienced players will know that it's risky. If the "Return to Hand" card is deemed invalid by another Effect Card there's no way for you to get your Bid Card back. Another clever but less common use of the "Return to Hand" card is to place it after a "Random Card" Effect Card, in case the card that you draw at random is undesirable or if you would like to use it during another turn. Or, after a "Double Points" or "Half Points" card if you don't want those cards to take effect. That way you can potentially avoid disaster! 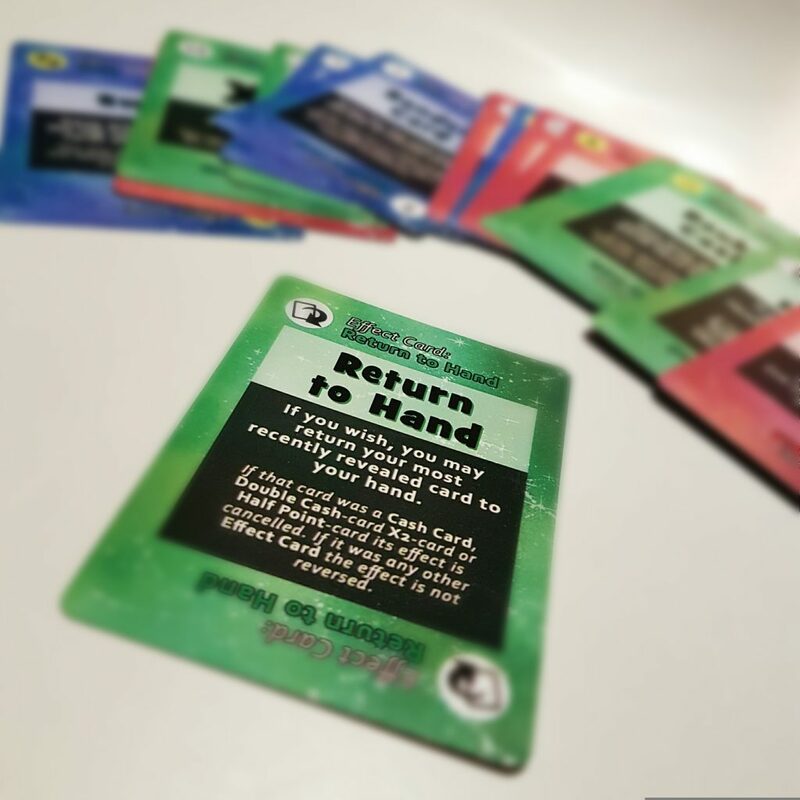 Finally, the "Return to Hand" card seems to be the most popular card to "waste" by playing it as your only card on a bid you don't intend to win. Remember, you must play at least one card on each of the Point Cards. In other words, because its use is sometimes risky, it is often regarded as the least useful Effect Card. 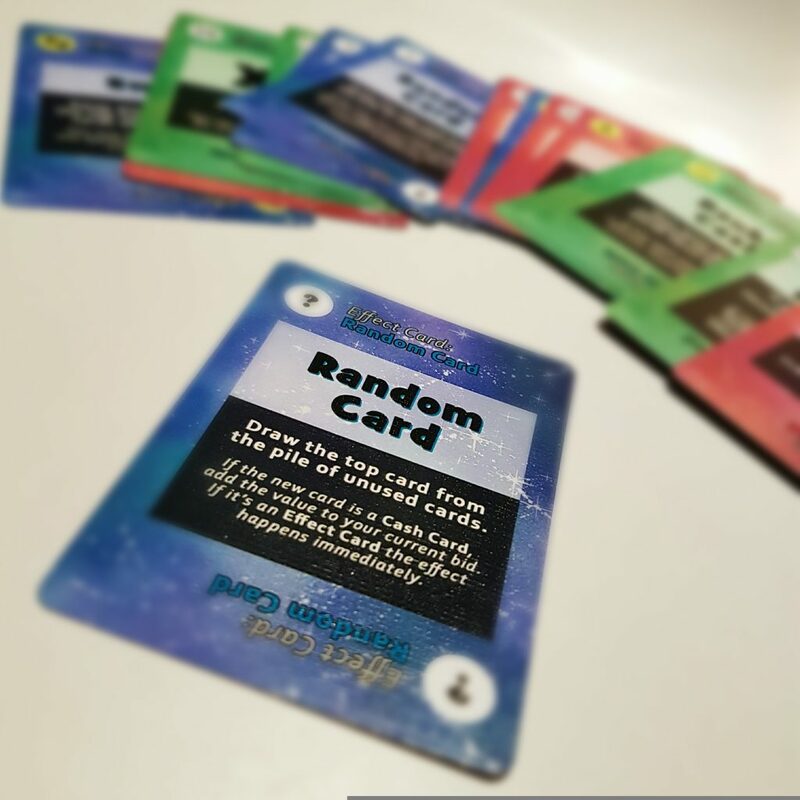 Perhaps one of the most interesting cards in the deck, "Random Card" has you draw a card from the draw pile — you don't know what it will be! Most likely, it will add to your current bid. Hilarious situations can also arise if the drawn card is an Effect Card. For example, you might accidentally double or halve the points you're currently bidding on. Or, you might find yourself in a deciding position if, during a close race between multiple players, you draw the "Remove Bid" Effect Card. One strategic use of the card is to play it as your only card on a very low Point Card. If no other players bid on it because they're using their Bid Cards on the more valuable bids, all you need to do is draw a number and the points are yours. And if someone does place a small bid, you might get lucky and draw a higher number. That's a lucky shot though — this strategy works best if you only have high Bid Cards on your hand that you don't want to "waste" on a lower-end bid. In terms of pure bid value, this may just be the most valuable card to have in your hand. Why? Because you get to remove a previously revealed Bid Card from an opponent! In other words, it's almost like having a high-value bid card in your hand. Naturally, you do not want to play this card early on. In fact, you probably want to place it at the bottom of your bid pile. You want your opponents to reveal as many cards as possible before you reveal the "Remove Bid" card to maximize its impact, and you want to avoid that it's deemed invalid by another Effect Card. So save it for last! Some truly interesting situations can arise if, as a result of this card, you find yourself in a deciding position: which opponent should you remove a card from? Both in terms of who will win the current bid, and in terms of who will win the entire game; sometimes it might be desirable to "let" someone win a bid in order for someone else to win the game. Here's one of the most common in-your-face cards. Simply, the next card to be revealed by an opponent is discarded — it does not add to their bid value, and if it's an Effect Card the effect does not happen. Life is cruel. The placement of this card in your bid can be a bit tricky. Do you want to reveal it early on or risk waiting for too long? Experienced players will reveal their least valuable cards first, saving higher numbers for the bottom of their bid pile, so if you place "Next is Invalid" as your first or even second or third card, odds are it will only take away a low value. If you wait for too long, however, you run the risk of being the only player left with any cards to reveal. In other words, you will have ruined a great opportunity. In the standard version of the game, "self harm" is not possible, meaning the "Next is Invalid" card cannot affect yourself. In the "Advanced Play" rule book that comes with Highest Bidder: Art Auction, however, there's a suggested voluntary rule for experienced players that says that "Next is Invalid" can in fact backfire. This would normally be unintentional but can also be used strategically if you want to get rid of particular card. 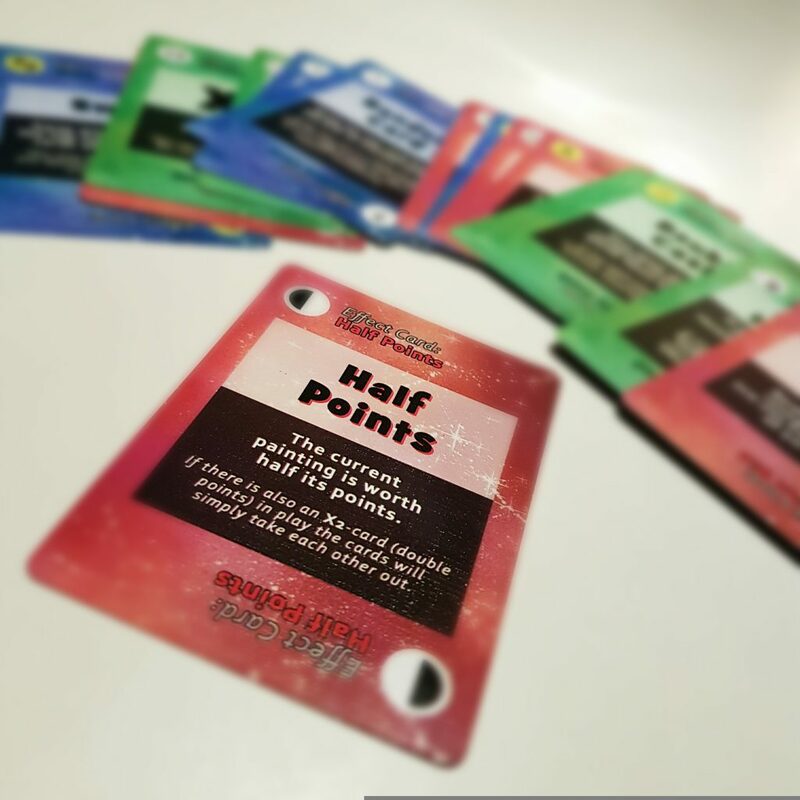 The final card to talk about in the standard version of the game is the "Half Points" card. It will simply lower the value of the card you are currently bidding on. There's only one copy of this card in a deck and it's one of the most valuable. If you find yourself holding it you're in a golden position: if you're unsure whether you can win a bid or not you can instead go for a lower scoring Point Card and, as your only card, play the "Half Points" card on the highest Point Card to ruin things for an opponent. You have the power to decide which cards are valuable and which aren't, without your opponents knowing about it in advance. Neat! The "Half Points" card can also be the source of some hilarious moments, particularly if it's drawn as the result of the "Random Card" Effect Card. On a side note, scores are not rounded up — 0.5 points is possible! As seen in Highest Bidder: Art Auction. It is recommended that these cards are only used by experienced players to maintain a balanced game. This card gives you a distinct advantage by letting you draw two new cards from the draw pile. In other words, you will have more to play with during the second and third bid. Since the effect of the card only happens once you reveal it in a bid, you usually want to play this card during the very first of the three turns of bidding. Be careful about the placement though: having it as your very first card (the top of your bid pile) puts it at greater risk of being stolen by another player through use of the "Steal" and "Swap" Effect Cards. An exception, of course, is if you are the very first player to reveal a card, in which case your first card is "safe". There are also exceptions when you do NOT want to have this card, particularly if the advanced Point Cards "The Alien" and "The Elephant" (see bottom of this page) are included. The Alien is a card you do not want to win as it takes away points, and The Elephant is a card on which you want to achieve a specific bid value. In terms of pure bid value, this along with "Remove Bid" is the most valuable Effect Card. Why? Because it doubles the value of whatever Bid Card comes before it. If, for example, you have the Bid Card valued 7 ($70,000 in Art Auction), you can use "Double Cash" to turn it into 14 ($140,000). Naturally, you want to play it after a high-value card. An interesting thing about the card is that it affects the most recent Bid Card, even if an Effect Card is revealed in between. If the Bid Card is later discarded by the use of "Remove Bid" the effect of "Double Cash" trickles down to the next most recent Bid Card — it is not discarded simply because the Bid Card which it was affecting is. Can you play two "Double Cash" cards in a row? Yes, you can. In fact, this is treated in the same way as Point Cards are treated when two "Double Points" (X2) cards appear: if doubled twice, a 3-point card ($30,000) becomes 12 ($120,000)! A highly strategic card, "Swap" lets you swap two cards between players. You can choose two opponents and swap their top (not yet revealed) cards in their bid piles, or you can swap your own next card with the next card of an opponent. Usually, you will want to swap with yourself rather than between two opponents. There are two aspects worth considering here: what card will you get from you opponent, and which card will they receive? The latter you probably already know. You wan to give your opponent something that won't be of use to them. Depending on your hand this could be a very low Bid Card, or a card that affects all players regardless of who reveals it (the "Double Points" and "Half Points" cards), or a card that you know will not affect you negatively. Swapping between two opponents is usually only done if you have no cards left yourself, or if you only have very good cards that you do not wish to give away. Funny situations can arise if what you swap completely changes who ends up winning the bid — prepare for some laughter! "Steal" is an interesting card because, unlike "Swap", you do not need to give a card away. You simply take the next card from an opponents bid pile and place it at the bottom of your own. You won't know what you get until you reveal your very last card, and it can make your bid a winning one if you're lucky. It's also incredibly fun if what you get is an Effect Card that ends up negatively affecting the player from which you stole it. Usually, you want to play this card early on in your bid pile to avoid the risk of other players having any cards left to reveal (in which case nothing happens). As with "Next is Invalid", there's a voluntary suggested rule in the Advanced Play rule book of Highest Bidder: Art Auction in which "Steal" can affect yourself — you simply move your next card to the bottom of your own pile. We've saved the perhaps most random card for last: "Shuffle" let's you rearrange the the cards in an opponents bid pile. I say "random" because this card can mess up your opponents entire bid in unexpected ways, however it may also backfire on yourself if your opponents original order would have played out better for you. And I say "rearrange" because you are allowed to freely rearrange them (without looking). If, for example, there are only two card it is difficult to "shuffle" them and you are allowed to just swap their positions. "Shuffle" doesn't take away any specific card, however it does take away two other things of value: your opponents strategy, and your opponents knowledge of how their bid will unfold. This can be incredibly important. "Shuffle" is a tempting card to "waste" as your only card on bids you don't intend to win, because it involves so much uncertainty and because all cards played by your opponent are still intact, they are just revealed in a different order. But for "Shuffle" to truly be of use you will need to include it among your higher bids — this is where it can ruin the strategy of another player enough to let you score in their stead. In situations where several players go all in on a single bid is also where "Shuffle" is the most fun because no one, not even the player whose cards you shuffled, knows what will happen. The colors of the Effect Cards have a meaning. Green cards add something positive, for example increasing your bid value or doubling points. Red cards do something negative to a player, for example taking something away from them. Blue cards are neutral. Even though it's the Art Auction cards you see pictured on this page, this is also true for the original Highest Bidder. In Highest Bidder: Art Auction there are two additional cards relevant to this strategy guide. These are not Effect Cards, but rather special Point Cards. 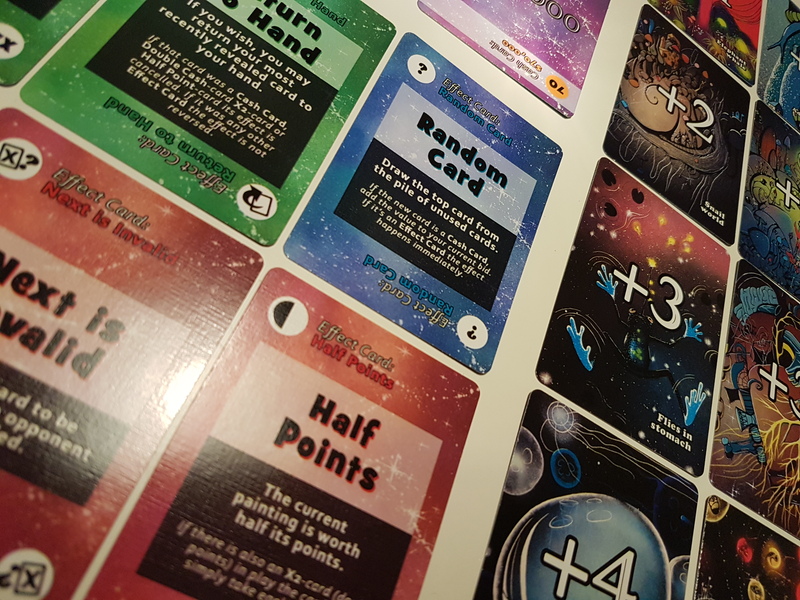 The advanced Effect Cards described above are designed to work well with these new Point Cards in play, for a balanced game where all cards feel like they have a purpose. In a normal bid you want to be the highest bidder. Not so when "The Elephant" appears. Instead, you want to bid exactly or as close as possible to a specific value: $30,000, $60,000 or $100,000 depending on the card. This card adds quite an interesting aspect as you might not want to have too much on your hand. In some cases, all players will go all in on a very low card. In other cases — if you also include "The Alien", which is highly recommended, you will find yourself forced to overbid. Typically, several players will bid the exact value. 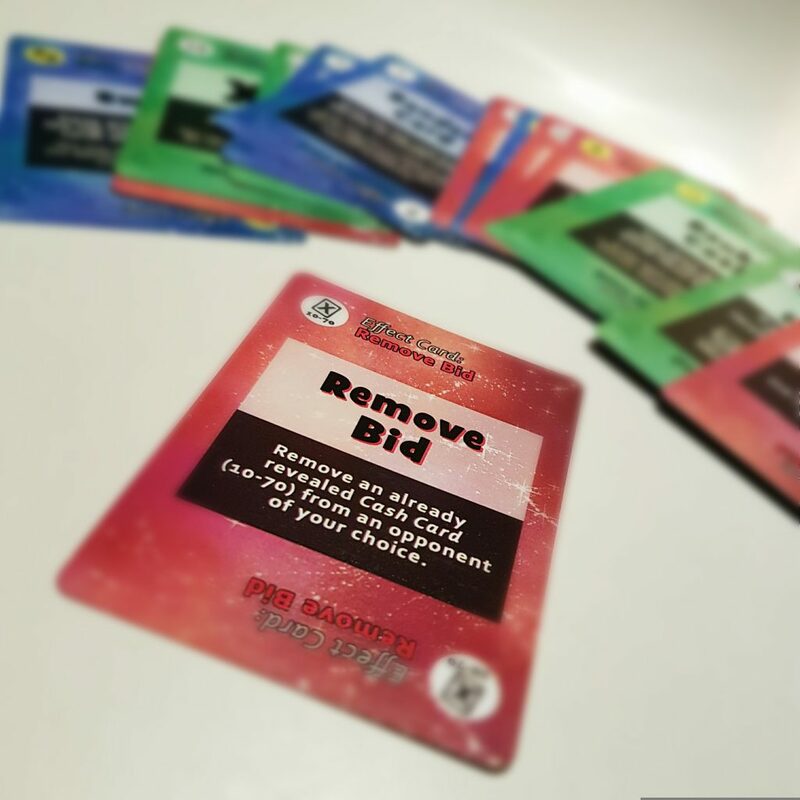 For that reason it is wise to include an Effect Card that will take away from other players such as "Next Is Invalid" or "Remove Bid". There are also a few Effect Cards you want to avoid, for example "Steal" or "Random Card". Anything that adds an element of uncertainty is best left for other bids. I have saved my absolute favorite card for last! "The Alien" is a card you do NOT want to win, because it cuts your final score at the end of your game in half. Spontaneously you might frown at this card, because 1) usually no one will win it as no one bids anything on them, and 2) if someone does win it it is hard to recover from. However, in terms of strategic thinking and hilarious situations, this is is by far the most interesting card in the game. There are six advanced Point Cards (three "The Elephant" and three "The Alien") and an equal number of regular Point Cards are to be removed if these are included. In other words, nearly half the cards will be Aliens and Elephants. Depending on how they appear in relation to each other, and to regular Point Cards, you may find yourself in some peculiar situations. Generally, you want to avoid playing anything at all on "The Alien". Since the rules say that you must play at least one card, you must choose which of your Effect Cards is least valuable to you and "waste" it. If you have the "Swap" Effect Card you're in a great position: play it immediately followed by a (low) Bid Card. That way the opponent with whom you swap is likely to go home with "The Alien". If you are unfortunate enough to end up with an alien you can probably kiss the high score goodbye. But it's not too late to win the game. 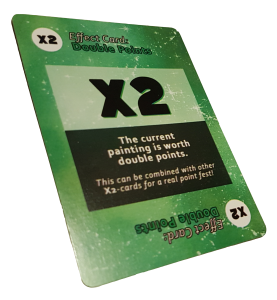 You can still get some "Double Points" cards as well as take home quite a few points during the important last round. And in all honesty, when it comes to "The Alien", it's not about the points. It's about the tricky situations it puts you in and the entertainment factor that comes with that. If you're a new player who has yet to buy Highest Bidder I hope the above has you intrigued and that you've come to realize what a strategic game Highest Bidder actually is. If you've got the game but haven't played it much yet, I hope you've learned some new strategies. You can also use the below form to contact me if you have any questions about card interaction.